The Altoona (PA) newspaper is featuring an article about Pastor Mark Lingenfelter from the Leamersville Grace Brethren Church and his new BMH book, “Chasing After Faith.” Here is an excerpt–to read the entire article, click here. When Mark and Angie Lingenfelter were expecting their third child, they anticipated a normal healthy girl. None of Angie’s prenatal tests or sonograms indicated otherwise. But just as a mother counts all the baby’s fingers and toes, Angie noticed their baby’s cleft palate. As difficult as it was for the Roaring Spring couple to know that the roof of their daughter’s mouth was deformed, more bad news would follow within the next couple of weeks when the newborn underwent treatment and examinations at Children’s Hospital in Pittsburgh. Faith is now a healthy, energetic 6-year-old, but in her few short years she has experienced several surgeries and life-threatening situations. Getting to know others who were enduring similar experiences led Mark, senior pastor at Leamersville Grace Brethren Church, Duncansville, to write a book about his family’s difficult times and how their faith encouraged them. “Through it all, we learned a lot about ourselves and the experiences of others,” he said. He said during difficult times, people make choices and he believes they can become bitter and angry or learn to trust God who has a sovereign plan. 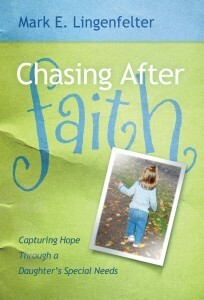 His began to write “Chasing After Faith,” when their daughter was 5, the age she underwent surgery to repair a congenital problem known as atrial septal defect. The procedure would close a hole in the upper two chambers of her heart that often leads to death in young adulthood if it is not repaired.